If Lake Orta is the poet’s lake and Lake Maggiore is the family’s lake, then I suppose Lake Como might be the movie star’s lake. The cosmopolitan lake. The lake most likely to appear in People magazine. But to see it that way might cast it in the wrong light. After all, we hear more about the celebrities at the lake than the lake itself. It’s true that Lake Como has received a lot of attention in the past few years, and because of this there is a kind of aura associated with it. If you come looking for this, you may not find it. More likely, you will find a friendly and accommodating atmosphere with lots of traditional Italy, including the delightful piazzas, restaurants and cathedrals you see throughout the country. There is a lot to see on Como if you are interested in immersing yourself in Italian culture. You can spend a week here and only begin to see what each of the lake towns has to offer. And if you are the sporting type, there is a lot to do, including boating, water skiing, swimming, biking and hiking. Our stay here will be short. Just one day, but long enough to take in the feeling of the place, check out some villas and enjoy a nice meal of regional specialties. The first stop is a lovely villa called Como Bianco, located directly on the water near the town of Cernobbio on the lake’s western shore. The place has a sense of refined old world charm to it, as the owners have preserved many of the traditional features of the house, including delightful credenzas, gilded mirrors, plush sofas and chandeliers. The owners have also thoughtfully included a number of modern amenities, including wireless Internet, a billiard room, cozy outdoor lounge chairs and an indoor playroom/lounge with a kid’s area, Jacuzzi tub and sauna. The villa itself is directly on the water, with a protected boat mooring area below the terraces. Next to the villa is a spacious garden area equipped for outdoor dining, table tennis and other activities. Como Bianco sleeps eight guests in four bedrooms with three baths. Several of our Como villas are suited to large groups, where you can consider a family reunion, a gathering of special friends, or even a wedding. 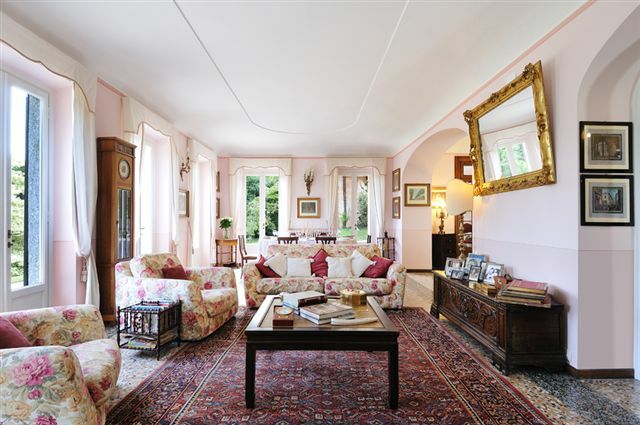 One of the best settings for this is Villa Rozzano, near the small town of San Siro. It’s a premium villa with lots of amenities and services, but it’s also comfortable and accommodating, with three floors of well appointed salons and bedrooms, a beautiful swimming pool and a sprawling lawn. At Villa Rozzano, it’s tempting spend your day right here playing tennis, enjoying the huge lawn and garden area, or going down to the lake side by way of a small tunnel that goes under the lake road. And to top it off, you can enjoy a meal provided by the in house chef. Il Pescatore has always been a favorite of our guests, and that is our next stop. To get there, we park in the town of S. Siro and walk a few hundred meters down the stone walkways of the village. We arrive at the water’s edge and enter a delightful house that used to be a fisherman’s cottage in times past. The traditional wooden fisherman’s chairs are still there in the water just in front of us. We enter by way of the kitchen, which is decorated with a suspended boat above our heads. Il Pescatore sleeps up to eight guests in three bedrooms. The most delightful aspect of the house is that there not just one, but three wonderful terraces, each offering a different view of the water. Check it out! Finally, we make a quick stop at Villa Diana, another lakeside villa not far away. Also suited for large groups, up to 15 guests, this villa has a long and interesting history, including a time when it was used as a restaurant and inn. It’s a very spacious house and it has a large professional kitchen, which makes it a good match for large gatherings or even a cooking seminar. Recently, the owner has added an innovative swimming pool right next to the house, which comes with a transparent pool house that allows it to be used in any kind of weather. On warm and sunny days, the pool house is easily retracted to provide an open area. To reward ourselves for a hard day of site inspections, we treat ourselves to lunch with our friends at Hotel Ristorante Sole. We say goodbye to our friends and take off for a three hour drive to Trento in the Dolomites. This entry was posted in 30 Days on the Road in Italy, Italy up close, The Lakes of Italy and tagged accommodations, cernobbio, como, como bianco, il pescatore, Italy, lago como, lake como, san siro, villa, villa diana, villa rozzano. Bookmark the permalink.